Recently there has been a ton of build up about antioxidants: drink green tea, eat pomegranates, try acai juice! All the hype is not totally overrated, evidence has been shown that antioxidants slow or reduce cancer and other diseases by fighting free radicals. Most of us already know that antioxidants are good cancer fighting agents, and free radicals are bad cancer causing molecules. What most of us don’t understand is what these guys actually do for… or to the body, and the science of it all. 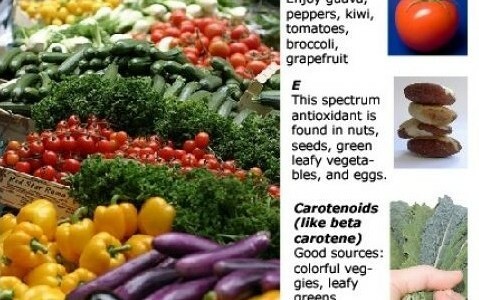 Let’s take a look and comprehend how antioxidants and free radicals work. Free radicals (aka oxidants) are naturally found in our body as the by-product of cells that react with oxygen, called oxidation reactions. They are highly unstable and reactive. Before I get scientific, let’s kick it back to high school chemistry and see what we can remember through the note passing and drooling. Atoms have protons and neutrons which stay in the nucleus, and electrons which surround the atom in shells. Electrons are involved in chemical reactions and are the substance that bonds atoms together. The bonding and reactions occur when the outer shell of electrons is not full, causing the atom to be unstable. All atoms want out of life is to be stable, so they bond with fellow unstable atoms by giving, taking, or sharing an electron. Now that we got that out of the way, let’s apply free radicals to this atomic equation. A free radical is unstable because it contains an odd number of electrons in the outer shell. Free radicals are "free" because they float around until they stabilize, and "radical" because they can take an electron from a wide variety of molecules. Once they steal this electron from another molecule of the body, that molecule becomes a free radical because it needs to stabilize as well, and so the free radical chain begins. The process is harmful to the body and causes cell and tissue damage, disease, and ageing (think: an apple turns brown from oxidation and free radical chains, we turn wrinkly!). Because free radicals are formed when oxygen interacts with certain molecules, factors such as pollution, cigarette smoke, herbicides, and other environmental factors can increase free radicals. 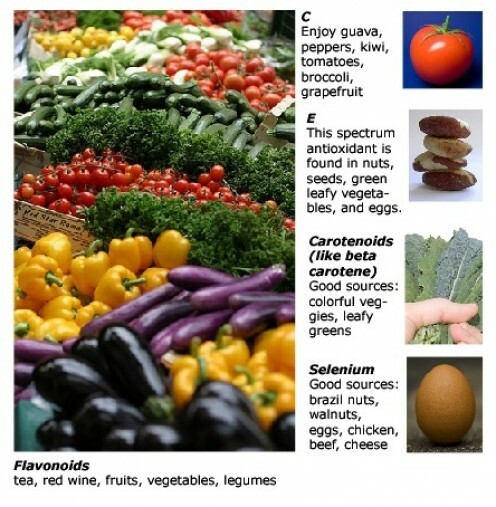 Free radical fighters, or antioxidants, can be found naturally in our body as enzymes. This is because oxidation reactions (free radical formers) are crucial to life, so our bodies require preexisting antioxidants. We can gain antioxidants by eating an assortment of healthy foods, especially foods high in vitamin A, C, and E, and food containing phytochemicals. Antioxidants are like the special forces of the body. They seek out free radicals and bind to them causing it to neutralize so they cannot harm the body anymore; they also attempt to repair damages done by oxidants. During this process, antioxidants become oxidants, so it is important to constantly replenish these nutrients. Different antioxidants do different things, this is why it is important to maintain a balanced diet . Antioxidants that come from foods containing beta carotene and vitamins C and E break free radical chains while antioxidant enzymes reduce the rate of chains or prevent them from beginning. Hopefully you have gained some insight into the fight against free radicals. Now when you hear all the talk about how important antioxidants are, you can tell your friends the scientific basis instead of just knowing that for some reason antioxidants are good. As with everything, there is evidence that says these findings are inconclusive in cancer prevention, but isn’t it important to just eat healthy anyway? Anything we can hope for or do to decrease cancer and disease is significant, so fill up on those antioxidant rich foods!